Tripp Lite's TLP706TELC surge suppressor offers complete AC and phone line surge suppression for comprehensive protection of workstations, desktop PCs, telecom systems and other sensitive electronics. High-grade AC surge suppression shields connected equipment from damage and performance problems due to transient surges. Set of RJ11 telephone line suppression jacks protect dial-up and DSL modem lines, fax machines, cordless phones and more. Integrated child safety covers. 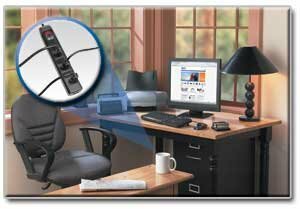 TLP706TELC offers 7 total outlets, 6 foot cord with a space-saving right angle plug and diagnostic LEDs to warn of wiring problems and suppressor damage. Heavy grade AC suppression rated at 1440 joules shields equipment from surges and line noise. Black suppressor housing with keyhole mounting tabs lets offers convenient protection of desktop computer equipment and accessories. It could happen in the blink of the eye: a sudden power surge that damages or destroys your valuable components. The solution to protect your workstations, PCs, telecom systems and sensitive electronics from surge damage and power-related problems? Tripp Lite's TLP706TELC Protect It!® Surge Suppressor. In one compact, cost-effective unit, the TLP706TELC provides reliable surge protection for your desktop computer setup and all of your electronics. It features seven AC outlets with child safety covers and a 1440-joule surge suppression rating—more joules mean more protection for your valuable components! The TLP706TELC also filters out disruptive line noise that can degrade component performance, helping to ensure that your equipment performs at its peak. The TLP706TELC offers cost-effective surge protection for PCs, peripheral devices and all electronics. It provides 1440 joules of surge suppression and features seven AC outlets with built-in child safety covers and one set of tel/DSL (RJ11) jacks. Its six-foot cord with space-saving right-angle plug allows furniture to be placed flush against the wall. Keyhole slots on the back of the unit allow the TLP706TELC to be mounted on a wall, and its trouble-free, all-black design integrates easily with a wide range of home and office applications. A phone connection represents a potential back door through which a damaging surge could reach your equipment. The TLP706TELC includes one set of built-in tel/DSL (RJ11) jacks to prevent surges from damaging your modem/fax/phone equipment (six-foot phone cord included). Various electromagnetic and radio sources can cause disruptive interference on the AC line. This EMI/RFI line noise is a common cause of incremental hardware damage, data corruption and performance problems. The TLP706TELC incorporates technology that filters out disruptive line noise, preventing it from affecting your equipment and helping to ensure peak performance. The TLP706TELC features 1440 joules of surge suppression to prevent surges from damaging your valuable electronics. Includes full normal mode (H-N) and common mode (N-G/H-G) line surge suppression. Two diagnostic LEDs (GROUNDED & PROTECTED) show power and protection status, enabling you to recognize power problems before they affect your valuable equipment. The GROUNDED LED verifies that the TLP706TELC is connected to a properly grounded wall outlet. The PROTECTED LED indicates that surge protection is available. If this PROTECTED LED ever goes out, simply return the TLP706TELC to Tripp Lite for a free replacement. An illuminated master switch provides one-touch power control over all components. The TLP706TELC comes with a lifetime product warranty and $50,000 Ultimate Lifetime Insurance (USA/Canada) to cover connected components against surge damage—for life!